Love is clearly in the air. I just watched two sweethearts go by my office window, off on a trail ride together. It’s a good thing the horses know where they’re going, because these two only have eyes for each other! And now I’m thinking about romantic horse jewelry. Don’t you just love those pieces of fine horse jewelry that combine the essentials of equine style with the promise of sweet romance? 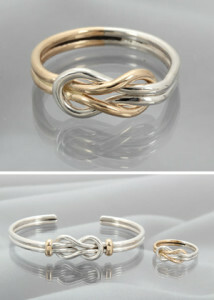 Check out this 14K gold and sterling silver cable knot ring. It’s the embodiment of romance: two individual loops intertwine in a knot that will last forever. The combination of two metals is so on-trend right now, and from a symbolic perspective, what a great way to comment on your relationship status! This ring is great for the horsewoman, because the low profile doesn’t interfere with everything you need to do during the day. There’s also a matching bracelet, which is pretty awesome. If you’re looking for a unique, budget-friendly equestrian themed wedding ring, the cable knot ring would be fantastic. Classic style can stand the test of time, and it looks great with everything. This is romance you can wear everyday! How about some old-school romance? 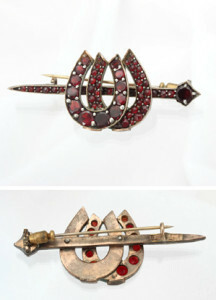 Lovers of vintage horse jewelry are going to flip for this Victorian Bohemian Garnet Double Horseshoe Brooch. Talk about classic romance! Two horseshoes are nestled close together, atop a horseshoe nail. The whole piece is beautifully set with Bohemian Garnets, a deep naturally red stone that evokes passion and enduring devotion. Bohemian garnets are the deepest red garnets: collectors love to add garnet horse jewelry to their collection. 2 1/8th inches long, weighing in at almost 7 grams, this is a substantial piece of Victorian horse jewelry. It looks phenomenal on a blazer lapel and will evoke gasps of delight from your sweetheart.